A protein that generates an autoimmune response in susceptible people, composed of gliadin and glutenin. Sensitive people’s bodies react to gluten as an intruder, firing off their immune systems but actually attacking themselves. This autoimmune reaction can lead to villous atrophy. Villi under an electron microscope © 2011 S. Schuller, Wellcome Images, used under Creative Commons license. Villous atrophy is the medical speak for small intestinal damage from gluten response. When a gluten sensitive eats a gluten containing food, the intestinal wall becomes inflamed. 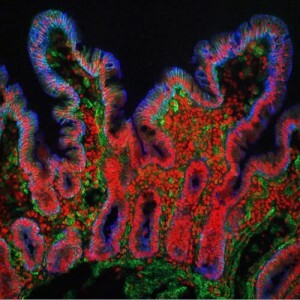 Over time, this inflammation can lead to a breakdown of the tiny finger like projections lining the small intestine, Villi. Why does Villous Atrophy matter? Without an intact absorptive surface in the digestive tract, there isn’t a way to get the nutrients in food into a body. This is why B-12 deficiencies, osteopenia, restless leg syndrome are all related to gluten sensitivity.